Hi, toralf. Thanks for your suggestion. This feature has been implemented in the upcoming version of AutoGUI. btw, where do you get all these icons? The cubes come from an old version of the CKEditor documentation. The equal sign comes from a screenshot of a program called TSW WebCoder. AutoGUI is not compatible with AHK v2 (be it AHK_L or AHK_H) and it is not also meant to be used as a compiled script, since I've not made any adaptations in the script as for that. AutoGUI already has this feature. 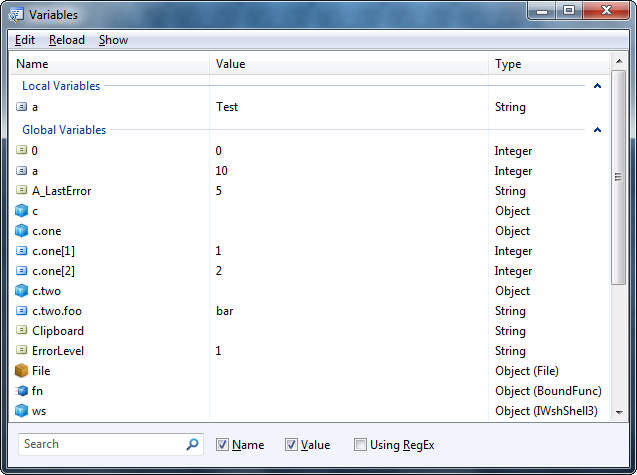 The toolbar button to the "Inspect Variables" window becomes visible once debug mode is started. I've seen this bug already but I couldn't determine its cause. It may be possible to find out the missing window with the Find functionality of WinSpy and then make it visible. kczx3 wrote: It would be nice if the Find/Replace dialog would continue the search at the top of the document once stops finding matches at the bottom. That way you don't have to search in the opposite direction.